Ancient Khmer jewelry returned to Cambodia on Friday as depicted on the cover of a 2008 book, left, and in a statement released by the Ministry of Culture, right. 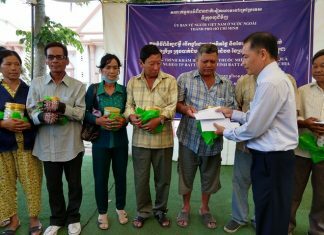 The Culture Ministry received 10 Angkorian gold jewelry pieces in a ceremony in London on Friday after they were handed over by a private collector, in a case that exemplifies the murky international trade in ancient Khmer artifacts. 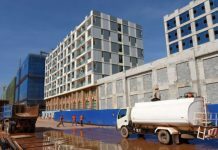 According to a statement released by the ministry the same day, representatives from the U.K. gallery Jonathan Tucker Antonia Tozer Asian Art, which listed the items for sale, presented the pieces to officials from the Cambodian Embassy in London. Ministry spokesman Thai Norak Sathya said the government could not find “anything to compare with our happiness” after the return of the artifacts, which were originally used to beautify statues and are made from gold mixed with other metals. But details remain unclear regarding how the artifacts left Cambodia in the first place, the identity of the private collector who owned them and the motivation behind their return. Jonathan Tucker, co-owner of the gallery, seemed unaware that the artifacts had been returned when contacted on Sunday. 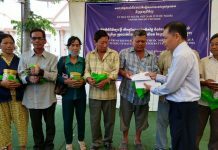 Culture Minister Phoeung Sakona said she did not know the identity of the private collector who had offered the items for sale through the London-based gallery. But she said art experts in Europe had alerted her after the gallery publicized its sale of the items in November, leading the ministry to send Cambodian and regional experts to examine the artifacts. Ms. Sakona said she did not know how the items had left Cambodia, but explained that they were an indelible part of the country’s artistic legacy. “This artistic style is Khmer—there are no other countries that made items like this,” she said. Mr. Norak Sathya, the ministry spokesman, was also unsure about when the artifacts had left Cambodia. He cited decades of wartime looting, but said that international and local law required that the artifacts be returned. Art experts and antiquities traders have bickered over laws governing the removal of Cambodia’s cultural patrimony, which dots galleries, museums and private collections across the world. Legal scholar and antiquities expert Tess Davis has cited French protectorate laws from as early as 1900 forbidding the removal of the artifacts, while auction houses maintain the removal of items from the country as late as 1999 abides by relevant regulations. Mr. Tucker, whose eponymous gallery’s website hosts at least half a dozen other items labeled as Khmer artifacts, maintained that he took necessary precautions to avoid selling looted items. “I take extensive precautions about provenance,” he said on Sunday. The gallery owner declined to elaborate on the identity of the jewelry collector or the involvement of Neil F. Perry, whom the ministry statement identified as a restorer for the gallery who aided in the items’ return. U.K. business registry records list a company under the name of “Neil F. Perry,” incorporated in March 2014 by Neil Perry and Ian Norman Perry, both of whose occupations are listed as restorer. Neil Perry-Smith, a London-based restorer, has been cited by Indian authorities as having worked on behalf of New York-based art dealer Subhash Kapoor during the time that Mr. Kapoor allegedly looted and resold about $100 million worth of Indian artifacts. Mr. Perry-Smith has denied any involvement. The Times of India has reported that Neil Perry-Smith also goes by Neil Perry, while the U.K. companies registry lists two restorers, Neil Perry and Neil Frederick Perry-Smith, both born on December 6, 1962. However, it could not be confirmed last night whether the names in fact refer to the same person. 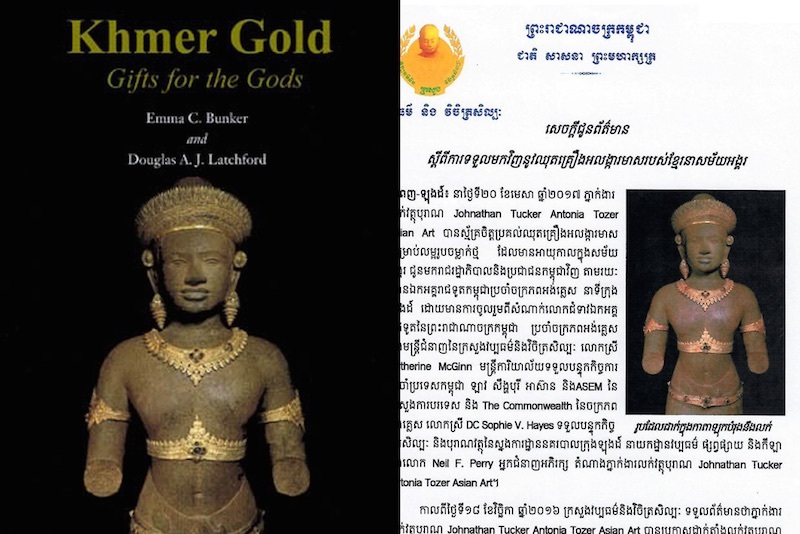 Some of the jewelry returned on Friday appears on the cover and in the pages of “Khmer Gold: Gifts for the Gods,” a 2008 book co-authored by Bangkok-based art collector Douglas Latchford and Emma C. Bunker, a U.S.-based expert on Khmer antiquities. In two separate court cases, U.S. authorities appeared to link Mr. Latchford and Ms. Bunker with involvement in illicit antiquities trafficking, although neither has been charged with any crimes nor named outright in the complaints. Mr. Latchford did not respond to a request for comment, and Ms. Bunker could not be reached. 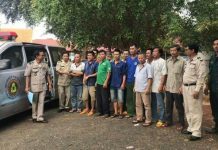 Mr. Norak Sathya, the ministry spokesman, said it remained unclear when the jewelry pieces would be shipped to Cambodia or where they would be stored. But when Mr. Latchford donated two sets of gold Angkorian regalia to the National Museum in 2008, he expressed hope that more pieces would wind up there. “I have been collecting gold for a number of years and I felt that it would be a good thing—a nice thing—if the museum had some gold which it could display,” he said at the time.